NeurOptimal® was created from a fundamentally different viewpoint than were other systems. 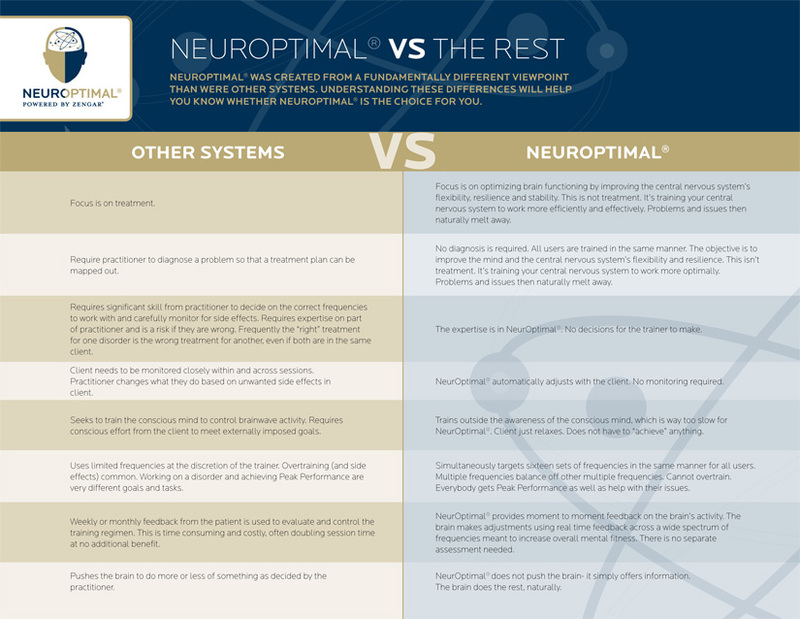 Understanding these differences will help you know whether NeurOptimal® is the choice for you. 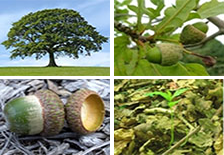 The way most systems work is that first the practitioner needs to make a diagnosis. (For this reason, with most systems the practitioner needs to be a licensed healthcare practitioner). The diagnosis will then determine what your brain will be told to do. The diagnosis can be made by interview, evaluation of behavior and/or extensive review of past history and medical records. A one-moment in time picture of your brain may also be conducted, that shows the dominant frequencies it is producing in what location. This one brief “slice of time” is then used to direct training over subsequent weeks or months. Needless to say, this evaluation process is time consuming and expensive, and the client gains no direct benefit from this cost. The brain or client is diagnosed as having a particular disorder which is then “treated”, relying heavily upon the knowledge and experience of the clinician to direct that treatment. Treatment is usually done by training up or down a minimal selection of frequencies in different locations. The feedback provided is used by the client to learn to produce more or less of these frequencies in the particular locations. Typically, the focus of training will be on one symptom cluster for a period of weeks or months until, hopefully, there is resolution, at which point the training will be adjusted to address another symptom cluster and so on. It is a linear, stepped process, and sometimes the frequencies needed for one set of symptoms in exactly wrong for another, leading to confusion and trial and error training. The practitioner needs to know a great deal about the brain to be able to work skillfully, and even then, in each case it can take weeks to know if what one is doing is actually the “right” thing that a particular brain needs. The practitioner must be skilled in watching for side effects, which are typically recognized when the client complains about them, at which point training is adjusted in some way. Again, trial and error. A first crucial difference is that when using NeurOptimal® there is no need for diagnosis. Why is this? NeurOptimal® is designed to give the brain information about what it has just done. The brain then uses this information to organize itself. During a session, the client listens to music or watches a movie file (avi, mov or other popular movie formats). The music/movie plays continuously when the brain is running “on course” (whatever that course is for that particular brain) but as soon as NeurOptimal®detects that the brain has “veered off” its path or has become less stable than what it just was, feedback is provided to the brain via a very brief pause in the sound. By offering this information NeurOptimal® gives the opportunity to the brain to adapt itself in response to the information, which then provides yet new and different information for NeurOptimal® to mirror back. Like a dance, NeurOptimal® and the brain adapt to each other microsecond by microsecond, dynamically adjusting their steps based on what the other has just done. This dynamic perspective is extremely different from the other, traditional neurofeedback systems. These systems require you to diagnose ahead, sometimes via what is called a QEEG or brain map, which is a decision on which direction the practitioner feels the brain needs to be pushed as a result of a single static picture taken days or weeks earlier. These are called protocols. Diagnosing and then treating in this way is actually a VERY awkward and slow feedback loop from NeurOptimal®’s perspective that does not offer the on-going “self-correction” that naturally happens as part of the brain’s dance with itself. With NeurOptimal® the brain is simply interacting adaptively with itself moment by moment, not striving to produce “more” of some frequency and “less” of another according to an outside “expert”. While those kinds of changes may be observed, they occur as part of an intrinsic self-organizing principal rather than an artificially imposed constraint. This is a large part of both the inherent power and safety of NeurOptimal®and how it invites very seamless change. The unique dynamical targeting of NeurOptimal® helps naturally release the places where you are “stuck” by providing information to the brain across a very wide range of frequencies. Many of these frequency bandwidths Zengar has itself “discovered,” described and developed over a period of years and tens of thousands of client hours. Other systems train with a very small “toolbox” of frequencies, creating states which, if over trained, can create major instabilities. NeurOptimal® targets sixteen different sets of frequencies across the right and left brain, each target naturally balancing off the effects of others. This means you will not “overtrain”, nor create unwanted states and — instead of just getting a limited possible “cure” for a problem — you get everything. So whether you come in with issues you want to address, improvements you’d like to make, personal growth or peak performance—you get it all. Pure. Simple. Safe. Effortless transformation. To schedule an appointment for Eating Disorder counseling and Disordered Eating Counseling or to obtain additional information about Eating Disorder counseling and Disordered Eating Counseling services, please contact Tender Rock Counseling Center & Acupuncture Clinic, in Bellevue / Factoria / Eastside, WA 98006. ( Non Profit Organization | Counselors with Christian Faith). Tender Rock Counseling Center / Acupuncture Clinic / Neurofeedback-NeurOptimal Training Center provide counseling and therapy services for individuals, couples and families in and around Redmond, Renton, Issaquah, Medina, Mercer Island, Sammamish, Woodinville, Newcastle, Kirkland and Bellevue, WA. Tender Rock Counseling / Acupuncture / Neurofeedback-NeurOptimal Training Centeris conveniently located in Bellevue, WA across from the Factoria Mall near the intersection of I-90 and I-405. It’s convenient for you to come here from King County: Redmond, Renton, Issaquah, Medina, Mercer Island, Sammamish, Woodinville, Newcastle, Kirkland and Bellevue, WA.